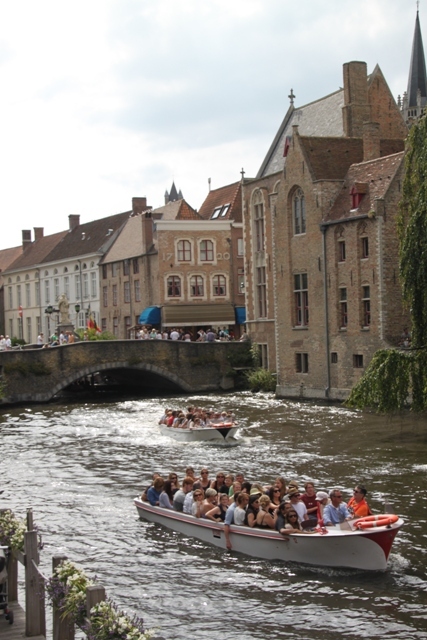 No visit to Bruges is complete without a boat trip along the canals. Or so they say in every guidebook. Husband and I had done this years ago, remembered it as a fun experience and definitely wanted to do it again on this trip. Not so enamoured with it unfortunately, just a bit disappointed and I wouldn’t do it again. Sometimes good memories should be left alone…. We joined the largest line ever to board our boat. Armed with ice-creams the wait wasn’t actually as bad as it first seemed and the line moved speedily. The boat trips run pretty much constantly and take half an hour. There are lots of different places throughout the city where you can catch the boat, we just picked the first one we came upon. They say viewing the city from the water gives it a totally different feel than on foot. I preferred the “on foot” views. We were the last to board our boat, Husband got a seat at the side, Son and I had to squirm into the middle and take the final two places. Crammed in like sardines I took no pictures – too many heads in the way. The views are pretty but the commentary was limited (being polite) and poor (being honest). I was glad to get off in the end – a touch claustrophobic and not a fun experience at all. Husband had a marginally better experience, Son paid no attention whatsoever to the scenery and spent the entire half hour chatting to a new found friend. To be fair, I think it was the crowds and crowds of people and the production line feel of the whole experience that put me off. Had it been another time of year, less busy and we’d had more space on the boat it would have been a very different tale. Back on dry land we had a walk around arcaded Vismarkt, the old fish market and then strolled down to Nieuwe Gentweg and the almshouses. We were blown away by the beauty here, this is a stunning spot. 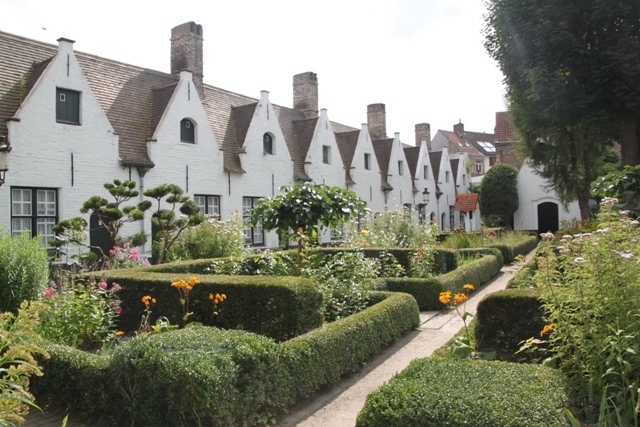 The courtyard garden of these houses built in 1613 is a real oasis of calm in the midst of this busy city. 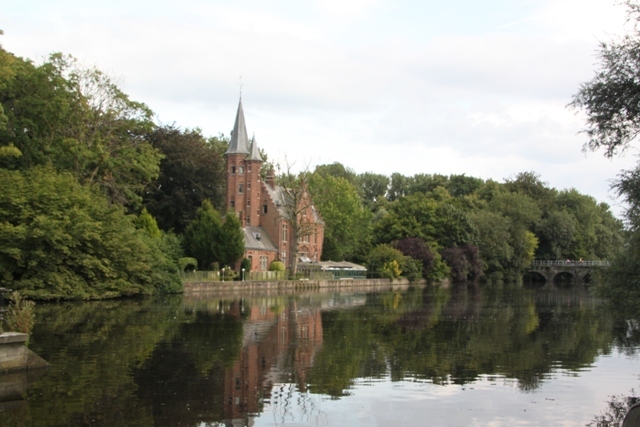 More strolling past more lovely canals and we reached the Begijnhof – once a large, enclosed sanctuary for women whose husbands were fighting in the Crusades. This is another of those incredibly tranquil places. Today it is partly occupied by Benedictine nuns but you can step inside the courtyard and have a look at the cluster of 17th century whitewashed houses. Quiet and calm behaviour is expected – strangely when that is called for it seems to have the opposite effect on Son, we didn’t linger too long. Just out the back is Lover’s Lake or Minnewater – so picturesque, it is actually joined to a reservoir and the canal system. Apparently from time to time you might see boats on it. Sitting on the wall and soaking up the tranquil atmosphere was more than pleasant – for five minutes or so anyway before Son wanted to get going again. Gorgeous, the other side of busy and bustling Bruges. Thanks James – easy to take nice pics in such a gorgeous and photogenic city though! Too bad about the crowd on the channel ride but good to keep in mind that if possible maybe try it when it is not so busy! Yes, I think that is totally the key. We’ve done it in the past and loved it, I think just the sheer volume of people on this occasion and the fact we were last on with the worst seats was the problem. Another less busy time, a completely different story. Pity about the boat ride because what could be more soothing than watching a city go by while gliding peacefully on the waters. The city looks absolutely stunning! The city is gorgeous and I think it would have been soothing and gorgeous on the boat except for the vast crowds. It just was probably the wrong time to do it!! We visited in August Sara and I think that was probably the absolute peak time for those crowds. Still, we did enjoy our stay in the city – I just think a boat ride at another less crowded time would be so much better. I never knew Bruges was so beautiful. I suppose the trick nay be to time your visit when it’s not so busy but that might be impossible looking at these photos. Gorgeous pictures, Joy. Love this place. I think it’s probably busy year round George like you say!! That is the price you pay though for such a gorgeous place. We went in summer though, peak holiday season and I think the crowds must have been at their highest level. Still, boat trip aside it didn’t spoil our enjoyment of this wonderful place. Pictures don’t always capture the beauty of a place so I’m sure it’s even more beautiful. The boats look horribly crowded. Given the poor narration, sounds like something to miss. We got the last seats on our boat – that just made it even worse. The narrator on this boat was also especially bad – he seemed really bored and fed up – perhaps he was having a bad day!! Bottom line, when I make it to this wonderful city, make the decision based on the lines. Loved the very first line in the post, no trip is complete without canal trip. For me Bruges was love at first sight. So beautiful, exotic in its own way. Your post took me back to the memories of my trip to Bruges. Love it. It is just a fantastic city Aanchal – despite having been there several times in the past I never cease to be blown away by beautiful Bruges. Glad you loved it too!! I’m sorry your boat ride was so naff. 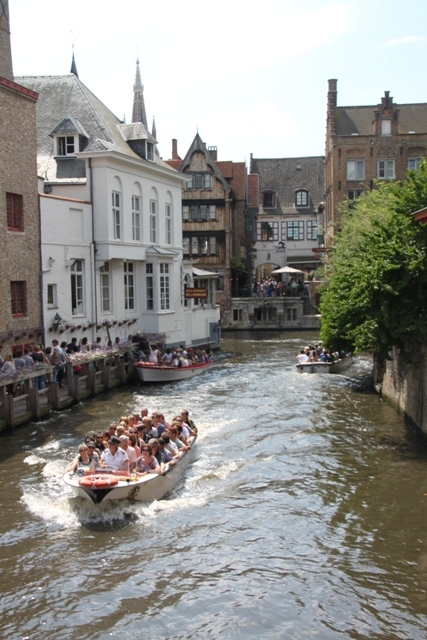 In both Bruges and Paris, I just used the boat rides to get off my feet after a long day of walking. I, therefore, didn’t care much about the tour guide element: I was just grateful for a seat. However, as a tourist attraction, that boat ride does sound very dismal. The almshouses, however, look like an incredible spot to wile away some time in. Really photogenic too. It’s funny what you said about your son not reacting that well to the need for quiet and calm as my boys are the exact same way. Any requirement for hushed voices makes their volume rise. Glad I’m not alone with that. I’ve done that before too Laura – just been grateful for somewhere to sit and chill for a while and even with the best narration ever not paid any notice due to sheer exhaustion!! This time we were disappointed, I think vast crowds and a fed up guide just weren’t a good mix. The almshouses totally made up for everything though, stunning and such a treat to find right in the middle of the city and all the crowds. Our son can always be relied on for this kind of thing – quiet and still incites the opposite every time!! Maybe it’s a boy thing!! Have a great weekend. We’ve enjoyed the boat trip in the past Charlotte, just not at all this time unfortunately. I much preferred wandering the streets camera in hand and looking at the boats on the canals without being on them!! I have no idea with flower names either but I agree, they are lovely aren’t they!! Beautiful photos! I really enjoyed our canal boat ride, but maybe it was because we got first choice on seats. Wish we’d made it to the lama houses, they look beautiful and calm! I did enjoy the boat ride on other times, just not this trip but I think being squeezed on at the very end after waiting in a hot, sticky line for ages probably didn’t help!! 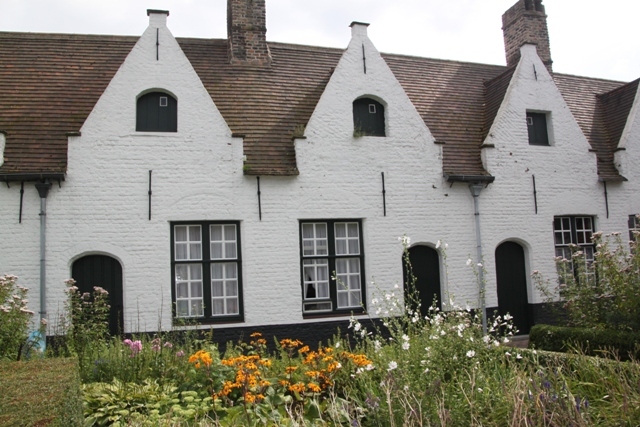 The almshouses were another of those unexpected treats, never been to them before on previous Bruges trips, would definitely go back there, it’s a gorgeous spot. Gorgeous as always – I appreciate your candid honesty about your travels, as in our world travelling with kids involves many compromises. And yet we carry on – because it is so beautiful and very much worthwhile, which you remind me again and again… Thank you! Thank you!! Sometimes things don’t go quite according to plan or expectation, but then that’s the joy of travelling I suppose, the unexpected element!! I love that picture with the tree and those buildings too Rosemary – I’ve seen it in other blog posts and was excited to get one of my very own!! 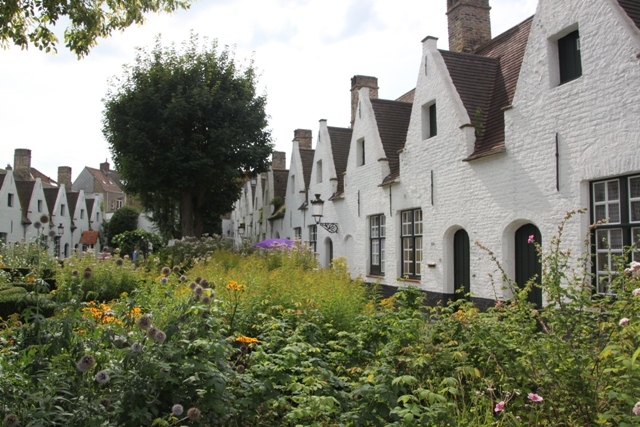 If you do make it back to Bruges be sure to check out those almshouses, it is so gorgeous and so peaceful, a real hidden gem. Hope your weekend is a great one too! Joy, such a shame there were too many people. Our tour by boat in Bruges is one of our favorite memories of the town, but now that I see your photos on land, I’m wishing we had spent more time exploring. We only had a half day, but I remember the town fondly. I love seeing all of your photographs, they are lovely. Thanks for sharing! I think it was just the sheer crowds Kirsten – a different time of year and that boat ride would have been such a different story. Still, we did enjoy strolling around this wonderful city but we were lucky enough to be there for a week, when you’re limited for time I think a boat ride would be the best way to see as much as you can. Maybe sometime you’ll be back and can do lots of strolling!! It is usually always nice to get on the river to see cities from another perspective. Too bad they had packed the boat (I can see the boats in you photos seems pretty packed as well). Maybe better outside of tourist season? 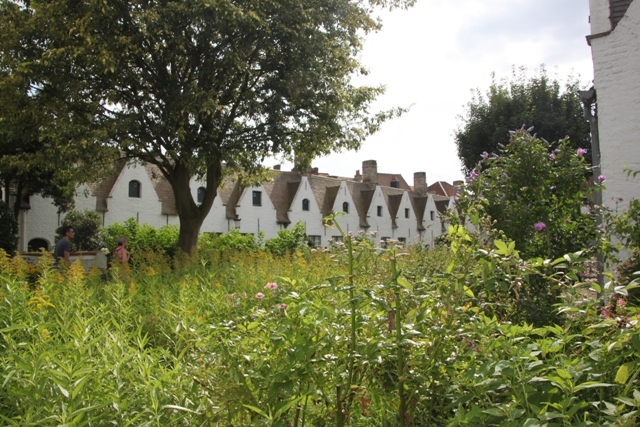 What is the history behind the almshouses? They are lovely! Do people live there now? I think that’s exactly it – we visited in peak tourist season hence those huge crowds. Another time of year, a different story. The almshouses originally housed poor elderly people or widows and were established by the guilds. People do still live there and I think quite a few of them are still kept for elderly people – a lovely place and a lovely idea! 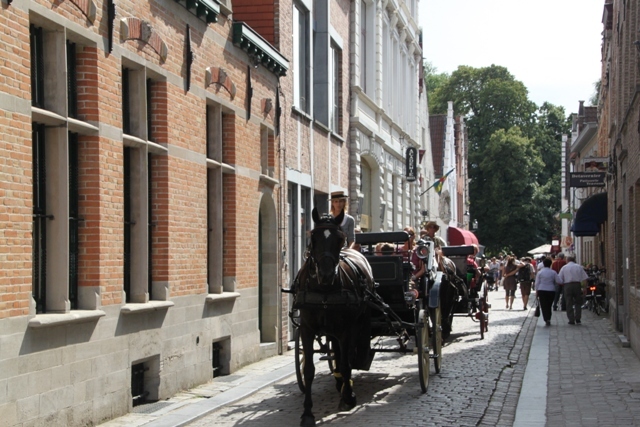 I know so little about Bruges (and Belgium in general) so I am just loving these posts! I would not be comfortable in that boat at all! Og my gosh, so packed! That was my problem – squashed into a boat is no fun like that!! 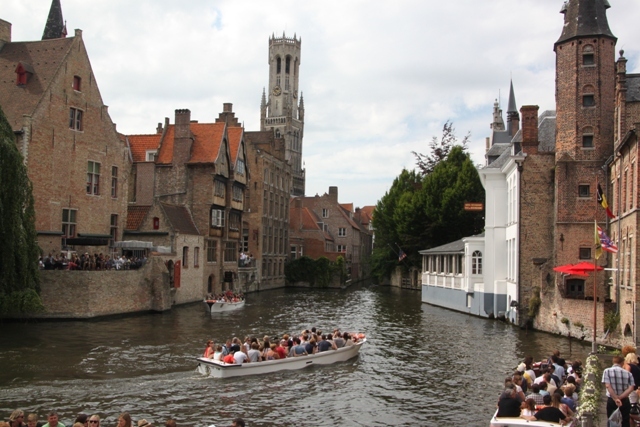 Bruges it gorgeous though – I love Belgium too, we had the best time, so much to see and do. Sorry about your boat experience – when we went it was early April and we had none of those problems. I think it is quite a good thing to do early on to get a feel for the place and where you might explore further, but I probably wouldn’t wait in a long queue for it. So yes, timing is all! That sounds like a good time to visit – I think last time we went (years ago) and loved the boat trip it was April/May time, a different story to August!! The boat didn’t look fun. Too crowded indeed! The gardens and architecture looks just lovely. The view from the bridge of Lover’s Lake is stunning. Lovely arm-chair tour! 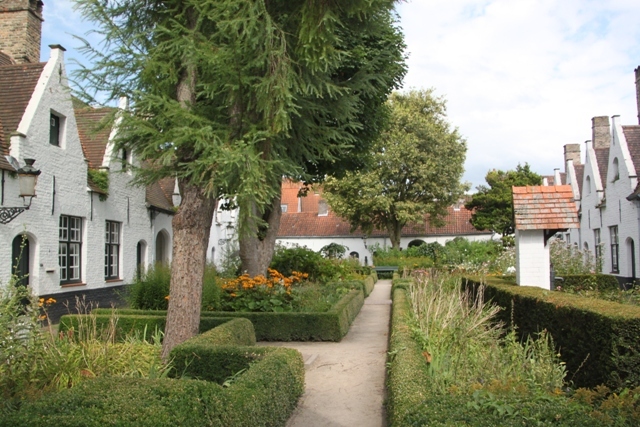 Bruges is such a beautiful city – gorgeous buildings everywhere but the gardens were such a hidden little treat. Thanks for coming on the tour!! 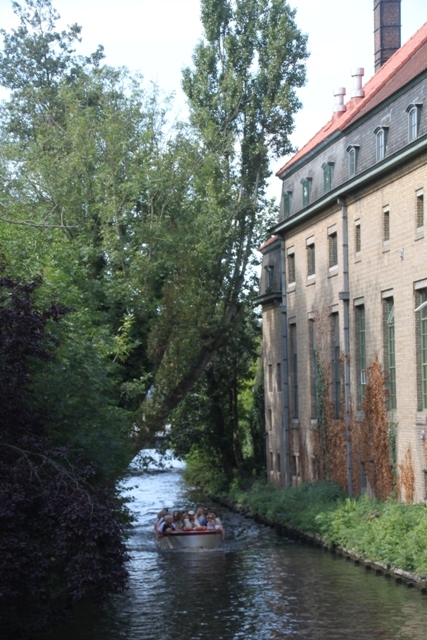 I think the canal trip would be a huge highlight – and with ice-creams too. For some reason I thought the boats would be a lot bigger… but I suppose they wouldn’t fit! 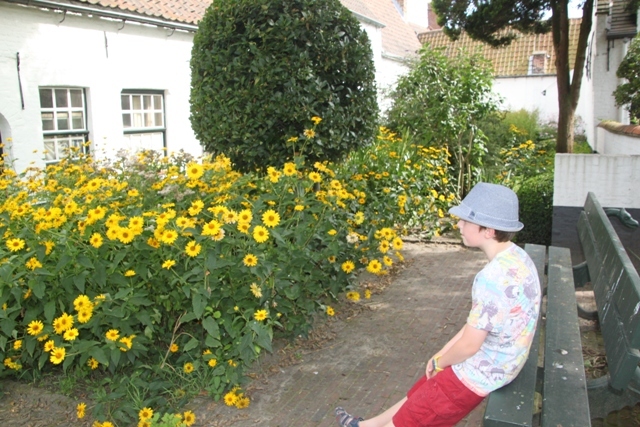 Begijnhof looks such a pretty place – but can see why your son was itching to go – so much more to see then hang around a garden! My son just couldn’t be still and quiet with all those trees to climb and empty space that just called out for running around!! It was nice to see it though,if only fleetingly!! It really is gorgeous – so many nooks and crannies and hidden gems too – we just loved it. 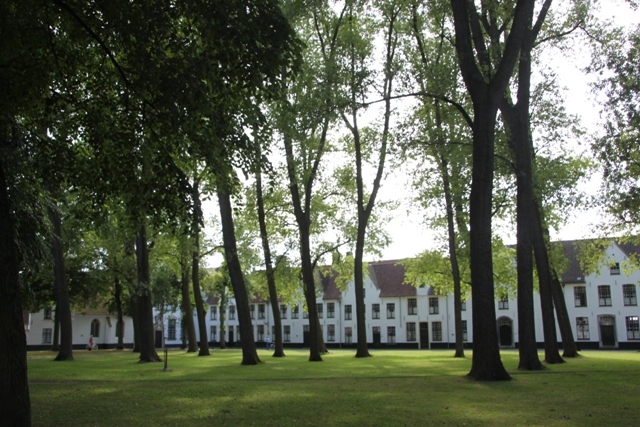 The Begijnhof you went to see was actually for the rich. 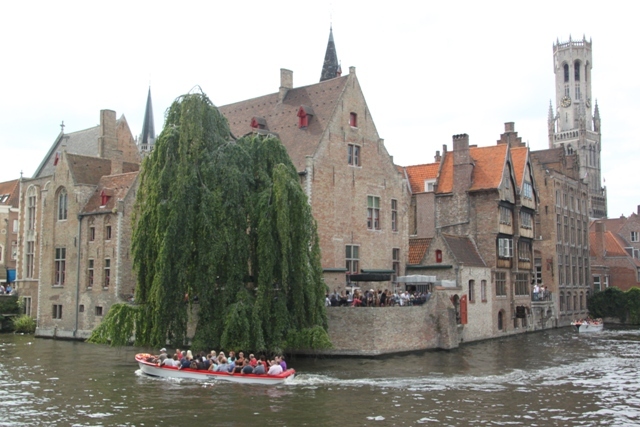 There are many other, smaller ones in Bruges… Glad to read you had a great time in Bruges! Loved it so much, next time need to look out for the smaller ones – thanks for the tip! So gorgeous and so quiet, a real contrast to the hustle and bustle elsewhere, we loved it too. Never again!! I felt so cramped right in the middle of that little boat, the pictures were just awful and we would have been better off just wandering around and spending the money on ice-cream!! Will keep in mind that Amsterdam boat trips offer a similar experience and avoid in future too! !